Yargh! Click here to play! Hoist the sails and raise the anchor because it's time to head out on the high seas in search of buried treasure. Join the captain's crew and you'll get to fire cannons, pillage ships, uncover treasure and pocket your gold doubloons. Captain Goldbeard will lead you through this high seas adventure. Not only is he a substitute, but when he appears in a winning combination, he doubles the prize. He only appears on selected reels so you'll have to keep a close eye on him. 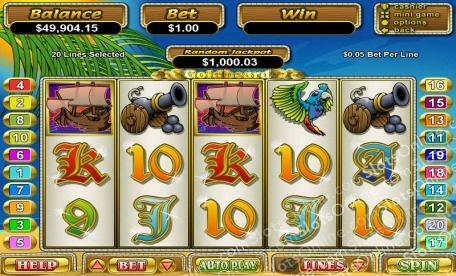 Two to five of Goldbeard's ship will pay out up to 2500 times your original line bet. Five of the captain's parrots will give you 1000 times your bet. Other symbols such as cannons and treasure chests will pay out as well. If you want to take home the ultimate treasure chest, you'll need to get Goldbeard on reels 1 and 5 to trigger the bonus and win free games. If you're lucky enough to spin five gold doubloons, you'll get a payday worth 100 times your total bet! Board the ship and brave the high seas for your chance to take home a treasure chest full of riches. The gold doubloons act as scatter icons. Two to five of these icons anywhere on the board will multiply your total bet respectively. Captain Goldbeard on reels 1 and 5 will trigger the bonus game. It's a game that rewards you with 2, 3, or 4 free games. During the free games, Goldbeard can appear on reel 3. If Goldbeard appears on reels 1 and 5 during the free games, more free games will be rewarded. All wins are tripled during free games. Captain Goldbeard, decked out in his blue hat with purple feather is the substitute symbol. He only appears on reels 1 and 5 but will substitue for all other symbols exlcuding the scatters. Prizes are doubled when he appears in a winning combination.